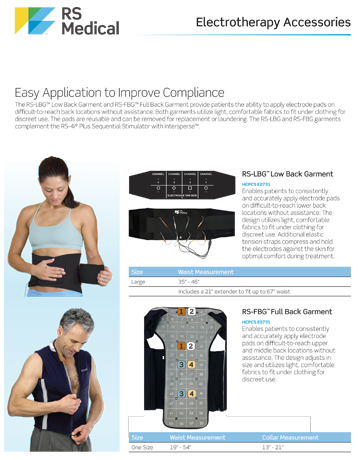 The unique RS-LBG™ Low Back Garment is an adjustable, belt-like garment that allows electrotherapy patients to position stimulator pads on the lower back and hips without help. Due to large surface area and hard-to-reach pad positions, back patients can have difficulty complying with electrotherapy treatments. By simply putting on a garment to properly position pads on the entire lower back, the RS-LBG simplifies treatment, making it practical for the patient at home. As a result, compliance with therapeutic regimens improve. The RS-LBG is available exclusively from RS Medical and is manufactured for optimal performance with the RS-4i Plus. It accommodates four channels and up to eight pads, so multiple sites can be treated simultaneously. The RS-LBG ships with an extender to accommodate varied girths. Pads are reusable and can be removed for garment laundering or replacement. The unique RS-FBG™ Full-Back Garment is an adjustable, vest-like garment that allows electrotherapy patients to position stimulator pads on the mid and upper back without help. Hard-to-reach pad positions make electrotherapy for the upper back a challenge for patients at home. By simply donning a garment that automatically places pads in the proper position, the RS-FBG makes at-home back treatments a breeze, greatly increasing patient compliance with treatment regimens. The garment is made with sturdy, washable stretch fabric, and incorporates adjustable side panels to create a close form fit regardless of body size and shape. A single size fits waist sizes 19 to 54 inches, collar sizes 13 to 21 inches. The RS-FBG is available exclusively from RS Medical and is manufactured for optimal performance with the RS-4i Plus. It accommodates four channels and up to eight pads, so multiple sites can be treated. Pads are reusable and can be removed for garment laundering or replacement.